Five Africa University students have completed research on building a biogas digester to produce renewable clean energy for household use in rural communities. A 30-member delegation from the Baltimore Washington Conference (BWC), led by Bishop LaTrelle Easterling, visited the Africa University campus in early July to participate in the biennial Zimbabwe Episcopal Area-BWC Pastors School. While there, Bishop Easterling presented the Vice Chancellor, Prof. Munashe Furusa, with a gift of $8,000 to help advance the mission and work of the institution. AU Advisors Leave Baltimore "Energized"
Mutare, Zimbabwe, March 21, 2015—The Foundation for Evangelism has announced that it is launching a campaign with Africa University to endow a professorship in the Faculty of Theology. The chair, which is to be endowed at the $1.5M level, would be named for John W. Z. Kurewa, the first vice chancellor of the university, who has served as the E. Stanley Jones Professor of Evangelism at Africa University since 2000. Four members of the foundation's board of directors—its chairman, Mr. Lawrence Klemann; members, Ms. Mary Brooke Casad and Dr. Stephen Gunter; and its president, Ms. Jane Wood—were present in Zimbabwe for the inauguration of the university's fourth vice chancellor, Prof. Munashe Furusa. The foundation's announcement was the highlight of the inaugural dinner, held on March 21st. Africa University’s vice chancellor has “a rags-to-riches story” as a first-generation college graduate, said the keynote speaker at the inauguration of Munashe Furusa, the United Methodist-related university’s new leader. Ask the members of Holman United Methodist Church about their December 2014 trip to the AU campus, and you’ll immediately notice their excitement. A 24-person delegation made the trip to Mutare, Zimbabwe. The group was led by Rev. Kelvin Sauls, the senior pastor of the Los Angeles-based congregation, and Rev. Judi Wortham- Sauls. Their aim for the trip was to build faith, broaden horizons and invite congregants to ‘be hope’ wherever they find themselves. The group included many persons who have been investing in AU for a very long time. “The visit to AU really exceeded any expectations that I may have had,” said Mrs. Wilma Pinder, a retired lawyer and former college lecturer. Now Mrs. Pinder and her husband, Dr. Frank E. Pinder III, a psychiatrist, are talking about the possibility of going back as short-term, visiting professors. The Pinders were impressed by the well-maintained and inviting nature of the campus as well as the diversity of the students. After spending time in a very frank and wide-ranging dialogue with more than 100 students, Rev. Sauls felt buoyed by the students’ commitment to pursuing stability and prosperity for Africa. Wilma Pinder echoed this view. “We will see every dollar we invest in AU multiplied a thousand times in terms of the returns,” she said. Linda Fuller, a retired businessperson, was impressed to find that young people who had never travelled outside their neighborhoods or countries before coming to Africa University, are embracing the institution’s pan-African ethos and moving forward with a hopeful and unified vision for the continent. Fuller described the experience on campus as “wonderful”. Since their return from Africa, members of the group have thrown themselves into organizing Holman UMC’s annual Valentine’s Day fundraiser for scholarship funds to support AU students. 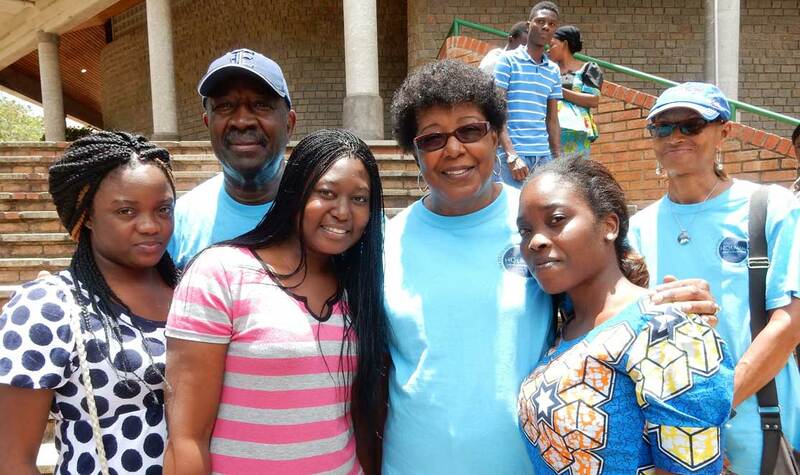 While the group was in South Africa, they met Elaine Sauls, a Holman UMC scholarship beneficiary from 2007 through 2009. Sauls, who grew up in Soweto, graduated from AU in 2010 with a Bachelor of Arts (Education) degree. She is now teaching at an elementary school in her home community. 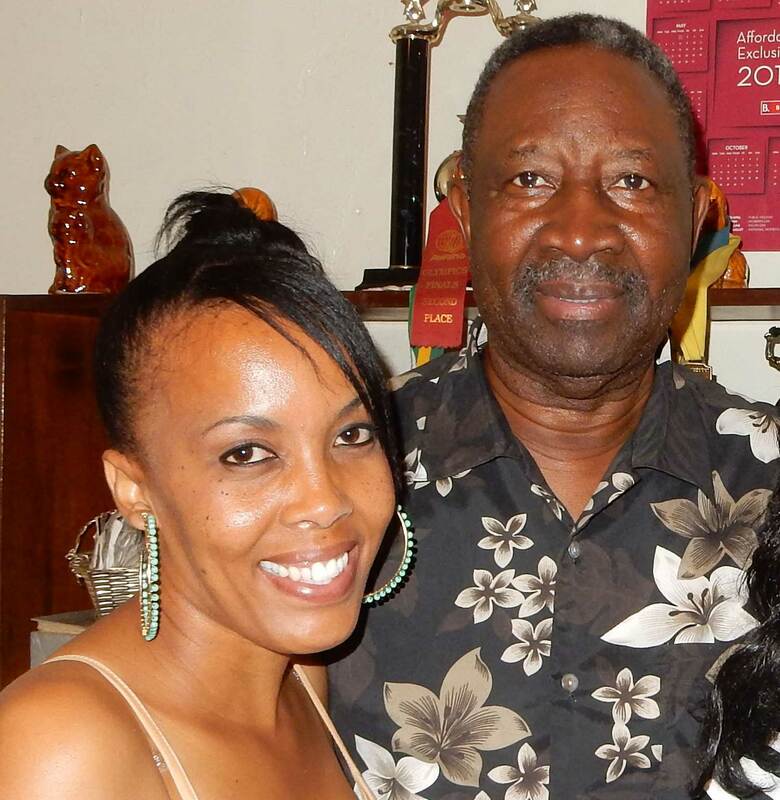 “She is very interesting and very appreciative of what we had done for her,” said Dr. Edward Terry, a member of Holman UMC who serves with Wilma Pinder and others on the church’s Africa University Committee. In August 2015, Holman UMC hopes to accompany a new student on his or her college journey by providing another scholarship for undergraduate studies at Africa University. Africa University has an additional six months to close a gap of $138K+ in gifts and reach its goal of $500,000 raised from African donors. Launched on March 1st, 2013, the goal of the ELMA Challenge Grant Appeal, “Africans for AU”, is $500,000 in gifts from qualified African donors. It was initially scheduled to end in June 2014, but ELMA has extended the challenge period to June, 30th, 2015. The extension gives AU the chance to bring in an additional $138K+ in gifts from those who benefit most—African families, churches, businesses and organizations. “The beauty of the ELMA Foundation’s Challenge Grant is that it allows the institution’s primary stakeholders—graduates and local and regional constituents—to invest annually in the stability of the university,” said Mr. James H. Salley, the associate vice chancellor for institutional advancement. “It enables Africa University to build capacity and provides an annual fund that is so critical to the bottom line of the university’s budget,” said Salley. Every penny raised and vetted as a gift from an African donor is being matched by the ELMA Foundation. Audited gift receipts, totaling $361,433.79 to date, have already been matched. Gifts have come from a wide array of university stakeholders and friends, including alumni, students, faculty, staff, trustees, and United Methodist churches in Africa. African businesses, institutions and non-governmental organizations, as well as prominent individuals, have responded very generously, contributing more than 65% of the total amount raised so far. Currently, the university needs $138,566.21 from African donors to reach its goal of $500K, but it hopes to go over the top on this appeal. Gifts to the “Africans for AU”/ELMA Challenge Grant Appeal can be made online via credit card at support-africauniversity.org. Or you can mail your check, made out to ‘Africa University’, to the Africa University Development Office, P O Box 340007, Nashville, TN 37203-0007. In Zimbabwe, please contact the Bursar/CFO, Ms. Irene Chibanda, (Tel: +263 20 60075 or +263 772 137 009), for directions regarding donation made by check or through ETFs. Board approval has cleared the way for the implementation of a PhD program in Peace, Leadership, Governance and Development at Africa University. Members of the AU Board of Directors approved the university’s first PhD program at their October 2014 meeting. The program targets the more than 300 graduates who currently hold master’s degrees from the university’s flagship Institute of Peace, Leadership and Governance, (IPLG), as well as policy makers, mediators and leaders from across sub-Saharan Africa. “The integrated nature of the PhD program combines course work and evidence-based research (and) stands to serve Africa by reminding practitioners, scholars and students, that the drive for sustainable peace should be anchored on the vital priority of human development, peace and stability; and democratic governance and ethical leadership,” said Dr. Pamela Machakanja, the institute’s director. The program is currently being reviewed for accreditation by the Zimbabwe Council for Higher Education (ZIMCHE). Once accredited, the university plans an initial pilot phase of two years. About five students will be enrolled each year, beginning in 2016.